Outlandish Observations: Audiobook available for pre-order! 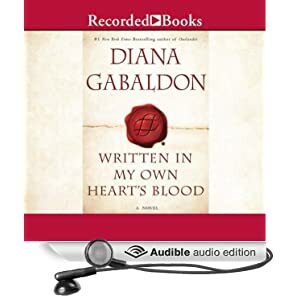 The audio version of Diana Gabaldon's upcoming novel, WRITTEN IN MY OWN HEART'S BLOOD, is now available for pre-order! It's currently listed on Amazon.com for $42.87. Fans of the OUTLANDER audiobooks will be delighted to hear that this audiobook will be narrated by Davina Porter. She's a marvelous reader, and she does a wonderful job with all the accents. I can't wait to add this audiobook to my collection! 1) The listing says 33 hours, but that is only an ESTIMATE! Diana Gabaldon is not quite finished writing the book (although she expects to be done within the next several weeks), and even she does not know yet how long the finished version of the audiobook might be. So we can expect that estimated recording time to change in the coming weeks. 2) The estimated release date for the audio version is June 10, 2014, the same day that the print and e-book versions will be published in the US and Canada. This date is also subject to change, but Diana Gabaldon has said repeatedly that Recorded Books will make every effort to get the audiobook out as close as possible to the hardcover publication date. PLEASE tell me Davina is reading it!!!!!!! Renee - I DID tell you that! Please read the whole post, OK? No sign of it as yet on audible.co.uk. So happy to hear Davina is reading again.